CanX-3, also known as BRIght Target Explorer (BRITE), is a nanosatellite constellation planned to make photometric observations of some of the brightest starts in the sky in order to measure their variability. The satellites are being developed by UTIAS/SFL, die Technische Universität Graz (the Technical University of Graz) and die Technische Universität Wien (Vienna University of Technology) with Sinclair Interplanetary, Routes AstroEngineering, and Ceravolo Optical Systems as subcontractors. The mission’s science team includes collaborators from Canada and Austria: the University of British Columbia, l’Université de Montréal, the University of Toronto, and die Universität Wien (the University of Vienna). The mission patch background is the Orion constellation, being one of several parts of the sky of interest to BRITE. Orion, the Hunter, was chosen to symbolize the hunt for stellar information. The Orion Nebula has been overlaid in the lower left, to symbolize the dispersion of heavy elements that result from the evolution of massive, luminous stars. The crosshairs symbolize targeting. Multiple stars in the Orion belt appear in the field of view, alluding to the differential nature of photometry. Two space agency logos appear to the left and right: the Canadian Space Agency (CSA) and the Austrian Research Promotion Agency (FFG – Österreichische Forschungsförderungsgesellschaft GmbH), respectively. 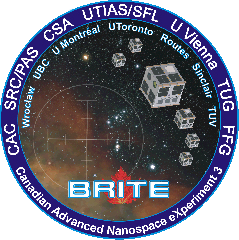 The maple leaf under “BRITE” credits Canada with the original concept for the mission, specifically Prof. Slavek Rucinski at University of Toronto. © 2014 University of Toronto Institute for Aerospace Studies Space Flight Lab. All rights reserved.